Does your guitar playing sometimes feel like a real struggle? You won’t struggle anymore after you eliminate the silent killer of your guitar technique: excess muscle tension. Excess muscle tension creates plateaus in your guitar speed and causes you to make a lot more mistakes when you play guitar. I want to share with you a step-by-step guide to eliminating excess muscle tension from your technique forever. Discover a simple process for relaxing excess tension from your technique, so you can play guitar faster, cleaner & more accurately than ever before. Learn how to “work backwards” from your top speed - a sneaky shortcut to huge guitar playing breakthroughs. 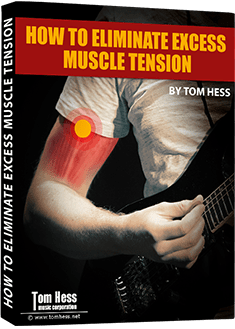 Eliminate the #1 cause of excess muscle tension and guitar speed plateaus. Learn how to avoid sloppy mistakes that make your playing sound bad. Get answers to the most common guitar practice questions that help you improve faster and feel more motivated to pick up your guitar each day. You don’t have to struggle to play your guitar anymore. Enter your name and email address and click the “Give Me Access Now” button to receive the free eGuide to making your guitar playing feel effortless. All information is kept 100% private and confidential.